I recently had lunch with Katy Basi, a lawyer whose practice focuses on estate and will planning, taxation and other estate related areas. One of the topics we discussed was what issues lawyers fail to consider when drafting wills these days (that passes for exciting lunch discussion for an accountant and a lawyer). I immediately asked her if she would like to write some guest blog posts on these issues and Katy agreed to do so. So today, without further ado, Katy discusses how many wills are drafted without consideration of RESPs. I have reviewed numerous wills in my practice as a wills and estates lawyer. Some were dusty with age, while others were signed fairly recently, but had evidently been drafted from a 20th century precedent. Thanks to the generosity of The Blunt Bean Counter, over the next few months I’ll guest post on a few 21st century estate planning topics, including digital assets and reproductive materials. Today’s topic is Registered Education Savings Plans (“RESPs”). An RESP is a contract constrained by numerous provisions of the Income Tax Act (Canada) (the “ITA”). 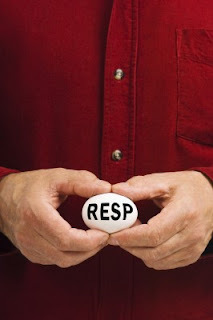 Many of my clients assume that their children (as the beneficiaries under their RESP) would automatically receive the RESP upon their death, just as if the children were beneficiaries under their Registered Retirement Savings Plan (“RRSP”). This assumption is, for the most part, dead wrong. While an RRSP collapses upon the death of the holder, an RESP contract generally provides that the contract survives the death of the subscriber. The subscriber of an RESP has a great deal of control over the RESP, so the relevant question on his death is…who is the new subscriber? Your lawyer drafting your will should ask you whether your spouse is a joint subscriber under your RESP. While not appropriate for all situations, having both spouses as joint subscribers is generally a smart move, as the RESP assets do not then fall into the estate until both spouses are deceased. This in turn may reduce both the estate administration tax (aka probate tax) payable on the death of the first spouse, and the likelihood of creditors of the first spouse making a successful claim against the RESP assets. (i) The subscriber makes all investment decisions for the RESP. (ii) The subscriber decides when amounts will be withdrawn from the RESP, how much they are, and whether the amounts are identified as a return of contributions (not taxable) or an educational assistance payment (taxable to a beneficiary under the RESP, as it consists of accumulated income and/or government grants). (iii) Subject to the terms of the RESP contract, a subscriber may require a return of contributions be paid to himself, rather than to the beneficiary. (iv) The subscriber receives all income and capital remaining in the RESP if the RESP has to be collapsed because the beneficiaries have not enrolled in qualifying educational programs within the prescribed time limits. (iii) the discretion to collapse the RESP if necessary. The new subscriber might be the executor, another family member, or a testamentary trust set up in the will for the benefit of the same child who is the beneficiary under the RESP. The last option is helpful in connecting the intended source of the funds for the RESP (being the money held in the testamentary trust) with the person in charge of the RESP (being the new subscriber, ie the testamentary trust itself). Let’s take the simple case of a sole surviving parent (“Dad”) leaving the residue of his estate to his only daughter, who is entitled to 10% of the residue at age 21, 50% at age 25 and the remainder at age 30 (this structure would usually qualify as a testamentary trust). Without an RESP provision, would the daughter be entitled to claim 10% of the RESP at age 21? What if the daughter was not enrolled in a qualifying educational program at that time? Government RESP grants may need to be repaid, and penalty taxes may be levied on any income payments made out of the RESP. It would be a very expensive 10%. What if Dad’s executor is a trust company? The trust company may require a specific RESP provision to be in Dad’s will. For example, the RESP provision may require the new subscriber to be the parent of the RESP beneficiary (if there is a parent still alive), the beneficiary herself (if she is over the age of majority – of course, this is akin to giving her the keys to the safe), or the guardian of the beneficiary (if the beneficiary is still a minor). Otherwise, the trust company might automatically become the subscriber, due to its status as executor of the estate – and the trust company may not want that responsibility. So, our simple case was not so simple after all – but it could have been worse! An even messier example follows. Grandfather funded an RESP during his lifetime for the benefit of his grandchildren. Under his will, Grandfather left half of the residue of his estate to his good friend Mavis, and the other half to a charity. Will Mavis and the charity demand that the RESP be collapsed and the RESP funds added to the residue, with all of the inequity and nasty tax consequences that would result? Grandfather would roll over in his grave – he needs an RESP provision in his will. To avoid family members, executors, lawyers and RESP providers spending valuable time and energy addressing such untenable situations, make sure that your will has an RESP provision too! Very useful post. I gather from reading between the lines that the nature (contributions vs income vs grants) of the money inside the RESP remains the same after death of the contributor i.e. contributions don't somehow turn into income because the original contributor died and now the new subscriber is withdrawing the money. Plus it seems, if those contributions end up in an estate, they would not be taxable. I asked Katy to answer, here is her response. "Yes, the death of the original subscriber does not change the characterization of the funds inside the RESP. When funds are withdrawn from an RESP, the funds are characterized as being contributions (not taxable), or income/government grants (taxable), regardless of the identity of the subscriber at that time. While the contributions are not subject to income tax in the hands of the recipient, as contributions are made with after-tax dollars (i.e. there is no income tax deduction permitted for RESP contributions), Ontario estate administration tax (ie probate tax) is another matter. If the sole subscriber of an RESP dies, and his/her estate is requires probate, then the RESP is considered to be an asset of the estate. Probate tax would apply on the value of the RESP at either the top rate in Ontario of 1.5%, or the lower rate of 0.5% if the assets of the estate do not exceed $50,000 in value." Thanks for the warning. I guess I'd better give our lawyer a call! Fantastic article. I recommend this specifically to all of my RESP clients in my practice but I had not thought of the example of the grandparent situation. I normally try to dissuade grandparents from opening RESPs directly unless there is concern the parents are not responsible. Here is another example where the grandparents holding an RESP may not be the most prudent.